The 21st edition of CFIA, which took place from 7-9th March 2017, has set a new record, with over 20,000 visitors connecting with more than 1450 exhibitors at the biggest food processing exhibition in France. The audience consisted of a wide spectrum of professionals in the food industry such as technicians, production managers, operators, sales professionals, marketers and R&D. During the exhibition, Russell Finex presented the latest separation equipment designed specifically for the food processing industry. An experienced team of sales agents advised on how to improve your production process with innovative sieving and filtration solutions. 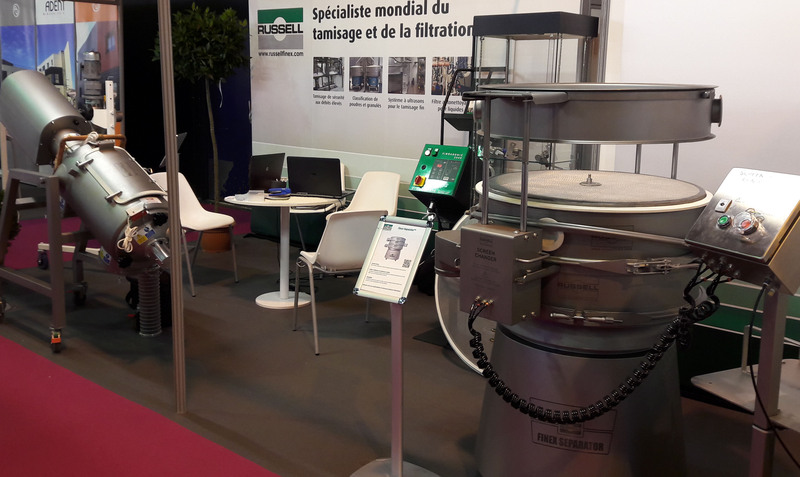 Visitors were able to see live demonstrations of the Finex Separator™ in combination with the Russell Screen Changer™ and the Russell Vibrasonic® Deblinding System, the Self-Cleaning Russell Eco Filter® and the Russell Liquid Solid Separator™. With over 80 years of experience in sieving, separation and filtration solutions, Russell Finex offers expertise to many companies within the food processing industry to help them to improve their product quality and processing efficiencies. If you were not able to visit Russell Finex at CFIA, don’t hesitate to visit us at Sepem Avignon in France at Stand 10, Hall A from the 25th - 27th April 2017. Alternatively contact us to find out more about how we can help you with your specific application.